Lippi won five Scudetto's in charge of Juventus. FORMER WORLD CUP-WINNING coach Marcello Lippi has been named to lead China’s national side following the resignation of Gao Hongbo, the Chinese Football Association announced Saturday. The appointment comes after World Cup qualifying losses by the men’s team to Syria and Uzbekistan left the Asian giant with virtually no chance of qualifying for Russia 2018. 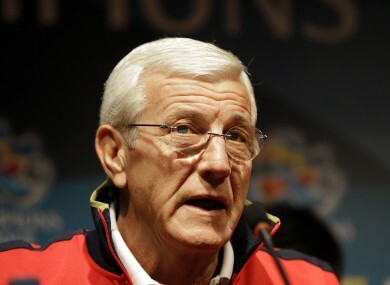 Lippi travelled to Beijing to accept an official offer for the post, according to a statement on the CFA’s web site. The decision was made “according to the CFA’s coach selection and hiring process and through friendly consultations on both sides”, it said. The announcement follows rumours earlier in the week that the Italian maestro would take over the struggling squad. Former China coach Gao resigned on October 11 following a 2-0 World Cup qualifying defeat to Uzbekistan, leaving the team with almost no window to qualify for the event. Sitting a lowly 78th in FIFA’s rankings, China have claimed just one point from four games and dropped to bottom place in a Group A which includes Iran, Uzbekistan, South Korea, Syria and Qatar. Email “Legendary Italian Marcello Lippi comes out of retirement to manage China”. Feedback on “Legendary Italian Marcello Lippi comes out of retirement to manage China”.